Install the Porcelain Tiles: Porcelain tiles have proven to be excellent for walls and door as they are impervious to common leakages. This is due to the high-density quotient of the porcelain material. 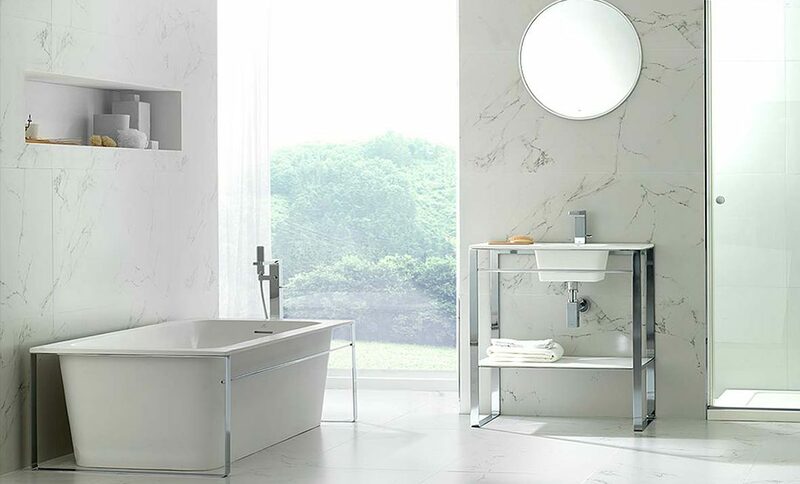 The water absorbing capacity of the porcelain tiles is immensely effective and therefore, in the modern bathroom architecture, these are finding their ways into the bathroom designs as well. In addition to the great functionality offered by these, the porcelain tiles also appear highly attractive due to the glossy surface with a matte finish that makes them waterproof. They also serve to be greatly durable and thus a great option for bathroom faucets. Allow No Gaps in the Pipe Joints: Most of the bathrooms are designed with concealed PVC pipelines. These pipe joints are vulnerable to leakages. Therefore, it is imperative to seal these joints with the help of a waterproofing tape. You must ensure that there are no gaps at the joints of the pipelines. Moreover, there should not be also any bends in the pipelines otherwise, they might become prone to water leakages. Offer a Gentle Slope to the Floor: This is a great technique to make your bathroom watertight as well as to prevent any water logging. While designing your bathroom space, you must ask the concerned team members to provide a gentle slope at the water outlets such that water flows naturally in that direction. An ideal slope in the bathroom area usually ranges between ¼ inch to 1/8 inch per running foot. In addition to this, you can also consider bringing in multiple drainage points in the overall bathroom space such that there is no scope left for water-clogging or stagnant water. Fixing of Tiles with Waterproof Adhesives: In the recent era, the conventional methods of fixing the bathroom tiles and bathroom faucets with cement and sand has been replaced by the use of proper adhesives. The adhesives that are available are ready to mix cementitious dry powder that is mixed with water to form a thick adhesive paste. This when applied on the bathroom tiles and bathroom faucets can make them strongly held to each other for a long duration of time. The hardening and waterproof properties of the adhesives prevent any possible leakage of water through them. Go for Waterproof Paint: Bathrooms are the areas in the house that are exposed to intense humidity and moisture. Therefore, you can go for the waterproof or semi-gloss paints that remain intact for long even after continuous wetting. These paints also prevent the soaking of any water and thus do not dampen the bathroom walls. Looking out for making your bathroom watertight? You can learn some effective tips related to the bathroom accessories like bathroom faucets and so more to ensure the same.